The relationships between form, function and ecology are crucial components of evolutionary biology. Data from the fossil record is critical here, through providing our only perspective on morphofunctional and ecological trends across macroevolutionary timescales. Mesozoic dinosaurs exhibited great plasticity in ecology, with repeated origination of specialised diets. In particular, although ancestrally carnivorous, herbivory evolved multiple times independently within the clade. This provides an ideal case-study in which to investigate signals associated with the evolution of specialised ecologies. However, whereas behaviour and performance can be readily observed in living taxa, extracting these data from fossil specimens requires a sophisticated methodological toolbox. Here, a suite of visualisation and biomechanical methods is used to reconstruct the feeding apparatus of Mesozoic dinosaurs, and investigate functional trends associated with dietary evolution. Results show that the evolution of gigantism was associated with dietary innovation within Sauropodomorpha, highlighting the importance of feeding behaviour in driving the diversification of dinosaur body plans via correlated evolution of characters. Comparison of clades reveals that pathways to herbivory were reveals repeated functional trends observed between them. Significant evidence of evolutionary convergence is observed between two subsets of taxa. However, multiple solutions to herbivory are still observed within Dinosauria. Although convergence within subsets of taxa is common, it is not observed between them due to functional constraints imposed during the early evolution of each group. This highlights the hierarchical nature of evolution, with adaptation driving convergence within regions of morphospace delimited by phylogenetic contingency. The area has produced a wide range of interesting mineral specimens. Examples of these are to be found in local and regional museum collections, and especially at the Natural History Museum in London. However, such was the importance of Britain in the development of mineralogy as a science that specimens from the English Midlands are to be seen in collections all over the world. Minerals such as phosgenite, matlockite and mottramite are recognised as having been first described from the English Midlands. The hard rock quarrying industry of Leicestershire means that fresh exposures are constantly being created, and new mineralogical discoveries continue to be made today. This talk will provide an overview of the fascinating stories associated with the mines, quarries and minerals, illustrated by images taken especially for a recently published book Minerals of the English Midlands. Antarctica is one of the world’s largest volcanic provinces, with the most recent widespread phase of volcanism stretching back, continuously, to 30 million years ago; coincident with the dawn of the Antarctic Ice Sheet. Many of the volcanoes preserve surprisingly fine details of their eruptive (environmental) setting, an ability that is particularly characteristic of glaciovolcanoes (i.e. volcanoes that erupt in association with ice). Several critical parameters of past ice masses can routinely be deduced from studying glaciovolcanic outcrops and, just as importantly, many of those parameters are deduced quantitatively, something no other methodology can achieve. Glaciovolcanic studies are thus the most powerful and holistic method for studying past ice masses currently available. Recent studies have also demonstrated unexpected, new evidence for non-glacial conditions. Although volcanic studies can be used to resolve important environmental problems, such studies are still very uncommon. However, they have been widely applied in Antarctica. This talk will briefly introduce Antarctica’s volcanoes, before presenting the results of selected volcanic studies, in order to demonstrate the power of such investigations for understanding Antarctica’s past environments, and how Antarctica’s ice sheet might impact on our future, in a warming world. Finally, it will be shown why it now seems that Antarctica’s volcanoes may also be the missing link that enabled Life to persist through multiple glacial cycles. Mineralisation of the southern edge of the carbonate platform in Derbyshire, has given rise to a number of interesting geological features that provide an opportunity for geological process understanding, and a challenge to engineering. Recent excavations have provided an opportunity to build on the legacy of research undertaken by Trevor Ford and others. The presentation will describe the geological context, the range of sediments, and the problems that they present to engineering. South Georgia is located in the paths of the Antarctic Circumpolar Current (ACC); the Southern Hemisphere Westerly Winds (SWW); it is south of the Antarctic Polar Front (APF); and is surrounded by an anticyclonic loop of the Southern ACC Front (SACCF). The waters surrounding South Georgia are highly productive; and variability in the interaction of the SACCF with the island may impact productivity on the shelf. Of wider significance, is the large phytoplankton bloom that occurs to the north-west of South Georgia, where the SACCF retroflects to return to its cyclonic circumpolar circulation. This bloom represents one of the largest seasonal sinks of atmospheric CO2 in the Southern Ocean. Given the likely importance of the Southern Ocean as a carbon sink/source during the transition between glacial and interglacial periods, a better understanding of the bloom dynamics could be important to our assessment of the Southern Ocean’s role in these transitions. This presentation will discuss new multi-proxy palaeoceanographic records of sea-surface temperature and productivity, from the South Georgia shelf, and their implications for our understanding of the climatic history of this area over the past ca. 15,000 years. The palaeoceanographic records, presented, support the hypothesis that the ice sheet on South Georgia during the Last Glacial Maximum extended onto the shelf. Potential evidence for the formation of a calving-bay re-entrant over Royal Bay trough, indicates that grounded ice may have been present on the shallower shelf until ca. 15 cal. kyr BP; having retreated rapidly over the deeper cross-shelf troughs after the Last Glacial Maximum. During the Holocene, I propose that both sea-surface temperature (SST), and shelf productivity, may have been driven by variation in the SWW, except during the early Holocene, when sea-ice proximity may play an important role in productivity variability. Changes in the intensity of the SWW at South Georgia, drive SST through their impact of local foehn wind frequency, and shelf productivity, through variation in coastal upwelling. This interpretation of the variability in shelf SST, and productivity, indicates that the SWW were more intense at South Georgia during the mid-Holocene, and weaker during the early and late Holocene. Granites, and in particular the British Caledonian granites, have shaped our understanding of crustal processes since the seminal work of James Hutton. Our understanding of granite formation has of course evolved significantly over the past 250 years, and in particular since the ground-breaking experimental work of Tuttle and Bowen in 1958 that confirmed that all granites must pass through a magmatic stage. Recent advances in high precision zircon geochronology now suggest that many batholiths represent long-lived, trans-crustal mushes that spend much of their history with no, or minimal, volumes of interstitial melt. In this talk, and with a particular focus on the Shap granite (Lake District), I will explore how recent advances in analytical techniques have changed our understanding of how and why Caledonian magmatism occurred, how it interacted with regional tectonics and how the combination of different high precision dating techniques can provide an unrivalled insight into the protracted histories of granite batholiths. River deposits form an important component of the sedimentary rock record. They are crucial for the interpretation of ancient environments, climatic regimes, and long-term patterns in weathering and erosion. However, we know that modern river deposits can be extremely complex in their architecture, which is not demonstrated in classic geological models. This complexity is due to the ways that meandering rivers change on both short and long timescales due to climate changes, oxbow lake formation, and other factors. It is particularly challenging to interpret the shape of meandering rivers from vertical exposures of rock successions. How can we reconstruct the complex “plan-view” shapes of rivers, when we usually only see vertical stacks of sediment exposed in rock faces? Furthermore, within the river deposits, we need to understand where mud and sand is distributed so that we can correctly interpret seismic profiles, and predict the likely distribution of petroleum resources. Here, I will present quantitative data collected from modern rivers with markedly differing morphologies has been enabled by the development of a robust, novel methodology for more accurately interpreting the rock record. Measurements of 35 morphometric parameters of 200 active meander bends from 13 different rivers were acquired using Google Earth Pro. An ancient point-bar deposit, from the Pennsylvanian in Wales, served as a test data set for accurate reconstruction of meander morphology. The work has found that the novel methodologies utilised in this study can enable meandering rivers to be more accurately interpreted from our fragmented geologic record. Dietary hypotheses of extinct animals are often based on comparative, or even speculative, evidence with little means of robust testing. Using robust, quantitative techniques to infer diets of extinct animals is therefore essential for representatively reconstructing past ecosystems. 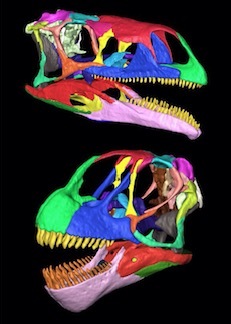 One such technique involves quantitative analysis of the 3D tooth surface textures of extinct animals, known as Dental Microwear Textural Analysis (DMTA). Microwear is formed during feeding as food items create characteristic tooth surface textures that vary with diet. This talk covers the principles, power and versatility of using DMTA to infer dietary characteristics of extinct animals. This talk also showcases DMTA research from my PhD on pterosaurs; extinct flying reptiles which lived above the heads of dinosaurs between 210–66 million years ago. DMTA is revealing pterosaurs exhibited large dietary variation, with different species potentially being fish-feeders, crunchy invertebrate consumers and opportunistic feeders. This is providing the first robust information on how these extinct animals truly fitted within their respective palaeoecosystems. The Mississippian Bowland Shale Formation is a highly metalliferous black shale (particularly V, Se) and a target for unconventional hydrocarbon exploration in the UK, and in equivalents across Europe, including the Geverik Member (Epen Formation), and Upper Alum Shale Formation. Despite this interest, the controls on bottom water anoxia (as the key requirement for metal fixation, organic matter preservation, and diagenetic pathway) are poorly constrained. In this talk I will provide a holistic perspective on the Bowland Shale, including focus on two biogeochemical aspects. Firstly, we will explore observations including sedimentology and geochemical palaeoredox proxies, in order to develop an understanding of sedimentary processes; and changing basin redox conditions in response to sea level fluctuation. Critically, anoxia was likely productivity-driven. In addition, a process of switching between ferruginous and euxinic conditions in anoxic porewaters, termed ‘redox oscillation’, is recognised by a distinctive redox-sensitive trace-element enrichment pattern, diagenetic mineral suite and organic geochemistry. This setting is partially analogous to the modern Amazon Shelf. Secondly, we will explore a candidate record of ancient chemosynthetic microbial mats preserved in the Bowland Shale. Microbial mats are markers for compressed redox gradients at seabed, biostabilisers of sediment, and are important mediators in cycling of S and C. Yet ancient examples are rare. A suite of observations suggest intermittently high redox gradients developed at seabed, and that these conditions were utilised by sulphide-oxidising mats. Therefore the Late Palaeozoic biosphere potentially included a pool of marine, benthic (chemoheterotrophic) microbial mats. Development of oscillatory redox conditions in porewaters, and eventual colonisation of seabed by candidate microbial mats, both suggest an environment that was subject to rapid accumulation of mud, reactive metals, and high rates of degradation of marine organic matter. Late Palaeozoic marine anoxia was potentially coupled to generally productive and nutrient-rich water column conditions associated with the ‘Phytoplankton Blackout’ phenomenon.